Never got what anyone saw in this movie at all. I left the cinema still waiting for the scary bits to start. The only shock I had was how bad it was! If that art holds I'll definitely stick an order in for this. Better film than I expected. First half was a bit of a retread but second half was great. May pick this up. Still havent seen this but i enjoyed the first. Hated the second. And hoped that the third would be good. From what i have heard, it is. So this is an actual sequel, and are they looking for the girl (his sister) from the first film? Correct. Not seen it myself. Reviews have been generally favourable. It's a pass for me, The shaky cam found footage films are annoying, they just make you feel nauseous!! Directed by Adam Wingard (director of You're Next & The Guest), it was made in secret. A teaser trailer was released months ago with title listed as "The Woods". 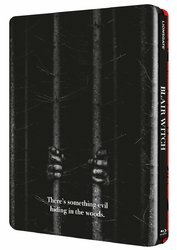 There was rumours that it could be a Blair Witch Project sequel, but the studio & director were adamant (as they would be if they were trying to keep a secret) that it was a brand new original idea. All the reviews I've read say it's anywhere from just tolerable to downright awful. It has a 36% rating on Rotten Tomatoes, and the audience ratings are almost as low. Don't know how some people here have the impression that the reviews are generally favorable for it. 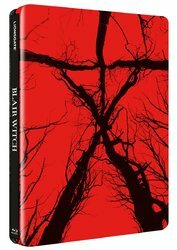 Bit of news from the Zavvi twitter account, they've just responded to someone saying that the original will also be getting a steelbook release. You missed out. The last 20 mins of the film were genuinely intense. Just brutally cold, dark and hopeless. I'm actually extremely happy this film is getting the steelbook treatment.